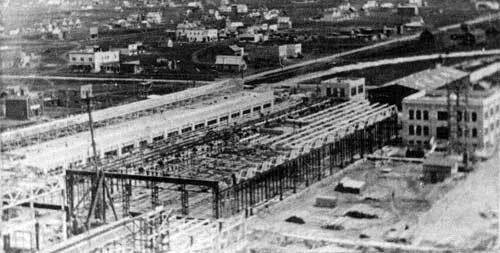 Birds-eye view of Transcona, 1911. Photo taken from the Grand Trunk Pacific water tower, looking northeast over the town. Transcona had its beginning with the decision of the Grand Trunk Pacific and the National Transcontinental Railway to co-operate to build a second railway line across Canada. The G.T.P. would build from Winnipeg to the west coast, the N.T.R. would complete lines to the east, and all required repair and maintenance would be carried out from a centrally-located shop. A large area of unoccupied, flat land east of Winnipeg proved to be suitable, and work was begun in 1908. Construction camps were set up for the crews. However, many men, foreseeing several years’ work, built homes nearby for their families. Stores, boarding houses and banks soon followed. By 1911, a Board of Trade had been formed and had made plans for the operation of the town, which was incorporated on 6 April 1912. A real estate boom saw the town develop rapidly, until by 1916 it was the second largest town in Manitoba. Over the next ten years, several recessions placed the town in bankruptcy from which it was only beginning to recover when the Great Depression arrived. The population remained below 6000 until the 1950s, and very little building was undertaken in that period. The post-war boom, industrial expansion, and the trend towards suburban living helped the population of Transcona double in the next ten years. Growth has continued at an average of 1000 persons per year, reaching almost 30,000 by 1985. Buildings in Transcona reflect the town’s growth pattern. Those which survive show a variety of architectural styles. Behind the facades, many stores from the 1910 to 1915 era are unchanged. The older homes within the central area are on narrow lots, and vary from large three-storey edifices to small slope-roofed bungalows. There are a few strips of “wartime housing” but those do not destroy the main impression one gains, which is that here is a small town built in the 1920s with neatly fenced yards and large trees. Construction over the past thirty years has taken place mainly on the periphery, thus allowing the heart of Transcona to retain a small town quality. The walk outlined here will guide you past buildings new and old as well as the sites of some structures which no longer exist. You will savour the unique spirit that identifies Transconathe friendly Park City. (1) We begin at the Transcona Historical Museum at 141 Regent Avenue West, which was declared an historic building in 1980. Built in 1926 for the Bank of Toronto, it is typical of prairie banks of the era, solid brick with limestone facings, a flat roof, and a high-ceilinged interior. At the back, an enclosed staircase leads to the second-floor apartment, usually occupied by the Bank Manager and his family. This was the third location for the Bank of Toronto in Transcona. Within fifteen years a need for further expansion was met with the purchase of the Canadian Bank of Commerce building diagonally across the street (see item 3). The older building was sold to the town of Transcona. As the Transcona Municipal Office, it remained a community landmark through the amalgamation with the City of Winnipeg in 1972 and was vacated in 1979 when remaining community administrative services were moved elsewhere. Being declared an historic building saved it from demolition, and it was partially renovated inside to house the Transcona Historical Museum. During its life as the Municipal Office, the building housed all administrative facilities, and for a time was also office and home for Dr. Peake, the town Medical Health Officer. (2) Across the street at 201 Regent Avenue West is the Transcona Postal Station. Through the winter of 1929, dynamite was used to excavate the foundation for the new Post Office, which was ready for service in early 1930. Mail had been handled in a small office on Bond Street for almost eighteen years before that, so townsfolk were happy to see the expansion. It was almost three decades more before letter carrier service was introduced (in 1958) and people no longer made the daily trip for mail (and visits). Perhaps this had more effect on community life than historians realize. (3) Canadian Bank of Commerce occupied the corner, at 200 Regent Avenue West as early as 1915. 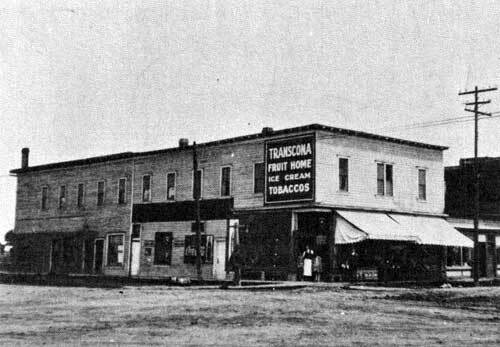 When they left Transcona in 1940, the building was purchased by the Bank of Toronto. Amalgamation with the Dominion Bank took place in 1955, and in 1962 the old building was enlarged and remodelled. This is the only bank which has been continuously servicing Transcona. (4) Walking south on Bond Street at 207, across the lane from the bank, is a small house which has been the office for Drs. Markovits & Markovits since they began their Transcona practice in 1931. (5) The next office at 201 Bond housed the second local newspaper, the “Transcona News”; the first paper, “Transcona Times,” was published from 1918 to 1921. The “News” began its printing in Winnipeg, but by 1931 had moved here. As business expanded a new building was erected which shall be seen later in the tour. (6) Continuing along Bond Street, we see a row of small shops on both sides of the street, none of which were damaged when the Princess Hotel at 202 Bond burned down in 1979. These shops frequently change owners. (7) Turn east (left) down Melrose Avenue, where narrow lots and small homes look much as they did fifty years ago. At 118 Melrose, a garage inconspicuously nestles amongst the homes. Not an imposing structure, it nevertheless has been here since 1911 when Joe Maranda built the garage and operated a bus line. The bus, or “jitney,” was a large, ten-passenger touring car which left for Winnipeg only when full. The undependable prairie trail often required all ten people to push the bus out of mud-holes. 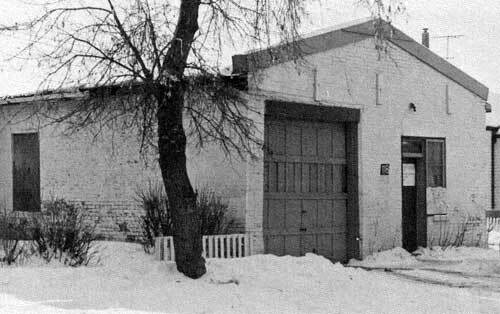 During World War One, the bus line was sold, and the building continued to be used as a garage, under various owners. (8) Continue down Melrose Avenue to Day Street (formerly Oxford Street), where you will find a plain, two-storey white apartment block at 100 Melrose Avenue East. As early as 1912, when a dry goods store occupied the main floor, this building was known as “The White House” and the name persists today. (9) Turn right along Day Street to the Service Station/Carwash at 107 Pandora Avenue West. From 1927 to the 1960s this was the terminal for the White Ribbon Bus Lines which provided daily bus service to Winnipeg. The waiting room is now an office, the garage has been converted and expanded, but the original structure is still visible. (10) Moving west along Pandora Avenue, back toward Bond Street gives you a view of the C.N. Yards. Though many windows in the buildings have been bricked up, few other changes have been made to their appearance. At Bond Street, you see the Shop Gate barring en-trance to the Midway which inter-sects the C.N. Yards. Most of the C.N. Shop Buildings face this road, and from them, each day at the 4 p.m. shift change, the workers stream out, and head down Bond Street bringing traffic to a halt. (11) On the northeast corner of Pandora and Bond a two-storey building is attached to a small store (Transcona Television). Originally this was a boardinghouse and confectionary shop. Looking closely, you can see turn-of-the-century architectural features, with panels of patterned sheet metal on the shed in back. (12) Across the street at 103 Bond Street, the Palma Hotel had been a two-storey hotel whose rooms were mainly rented by C.N. employees. Within the past twenty years, it has been remodelled, and renamed “The Pandora Inn,” still featuring a restaurant, rooms by the month, and a spacious lounge. (13) Dominion Lumber Yard can be seen beside and behind the Pandora Inn. Part of the old sheds are still visible, though a new fence along Pandora blocks most of them from view. E.J. Whitney bought the business from J. Maranda in 1911, then at retirement in 1949 sold to Hymie Margolis, who had owned the Transcona Fruit Home. (14) Passing the lumberyard, you can see the backs of many C.N. Shops Buildings, and a portion of the extensive trackage to your left. (15) Turn to the right at Pandora and Winona, and you will see the “First Transcona Scout Troop” Hall. After an earlier building was destroyed by fire, this one was erected by volunteer labor following a successful “buy-a-brick” campaign. Many Scout, Guide, and community events take place here, the first building to be owned by a Scout Troop in Canada. (16) As you walk down Winona towards the intersection with Regent, you find a row of modern shops on the north-east corner. Until 1985 this was the site of the Queen’s Court, a pioneer-style hotel with a double balcony across the front. The former frame building, erected in 1909, enlarged two years later, then completely remodelled in 1931, had 60 rooms for boarders plus a fine dining room. It is to be regretted that such a distinctive landmark of the early period in Transcona was demolished. (17) Proceed north, still along Winona Street, turning right (east) at Victoria. The lumberyard you pass has been here since before 1931 when North American Lumber bought the local firm of Head and Shannon who had built most of the homes in this area. (18) Further along Victoria, you find a concrete block grocery store at 121 Victoria Avenue West. On this site, the first Municipal Office and Fire Hall was erected in 1912. By 1941, the administrative services were moved to the Bank of Toronto building. Continued expansion of the town demanded larger premises, which were erected at Pandora Avenue and Madeline Street in 1956 for Police, Fire and Public Works, the Public Safety Building. The original site was sold, the buildings demolished, and a grocery store took its place. (19) Volunteers started a public library for Transcona, finding space wherever possible. In 1958, as the result of a public referendum, approval was given to erect a modern library. It is located at 111 Victoria Avenue West. One of the library’s Centennial displays led to an historical collection which was the beginning of the Transcona Museum. (21) At the corner of Victoria Avenue and Day Street, Manitoba Telephone System erected their own building in 1929. There were 90 phones in town in 1914, and the exchange was in an apartment block close to Central School. With expansions in 1954 and 1959, equipment was finally moved out of the old building, and it was demolished to make way for further enlargement. (22) From this corner you can look down the street to Central School. Despite many additions and renovations since it was built in 1913, the basic structure can still be recognized. Looking down Day Street at this point, you will notice wider boulevards on the west side. The town engineers felt that surface drainage was the most practical system while town finances were in poor shape. As a result, a series of inter-connecting ditches collected storm and spring run-off water along the town’s secondary routes. With the increase in paved roads and new homes, an elaborate storm and sewer water drainage system was installed along the ditches, which were then filled and sodded with grass. 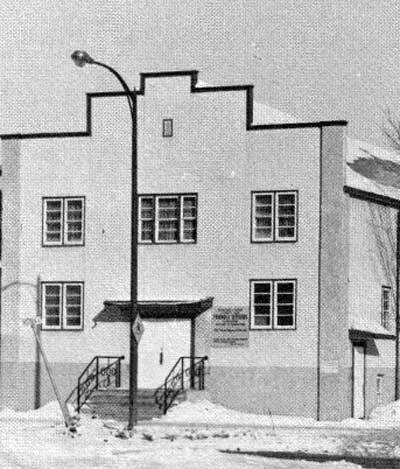 (23) St. Michael’s Parish Hall, on the Northeast corner of Victoria Avenue and Day Street, was completed in 1950, in time to provide eating facilities for evacuees from the Winnipeg flood. Over 450 people were housed in halls and private homes in Transcona until the flood was over. St. Michael’s Ukrainian Catholic Parish had been organized in 1913, holding services in Assumption Church until their own building was completed in 1917. As the parish expanded, a new hall was built on Victoria Avenue, several blocks away. By 1958, services were held in the parish hall, and a new church, to the north, incorporating the shield of St. Michael, was completed by 1965. (24) Proceed south now toward the centre of Transcona along Day Street. Past the lane on the east side, a collection of small stores share one building at 101 Regent Avenue East. In 1910, R.S. Campbell visited the construction site, and envisioned the town that would grow. He built a two-storey complex with office space and a large meeting room upstairs, and at street level, shops, including his own hardware store on the corner. The meeting area became known as “Campbell’s Hall,” and provided space for many public events including the planning for town incorporation. R.S. Campbell went into real estate and eventually moved from Transcona. By 1925 his hardware store was sold to Hymie Margolis who operated it as Transcona Fruit Home until he purchased Dominion Lumber in 1949. The store continued under this name until 1983. During the thirties the upper section was found to be structurally unsound and was removed. Though not impressive in appearance, this building has been the scene of many debates, planning sessions, and other important events which have shaped Transcona’s history. (25) Directly across the street on the northwest corner is the Regent Restaurant. Though this spot has many stories, the most vivid local recollections centre around Tony Casagrande and his Cafe, where everyone gathered after sports events to discuss the game over coffee. The walls were covered with photos of teams. (26) As you walk along Regent Avenue, look at the rooftop over the Household Finance office. Many will recognize the old style of metal rooftop for Safeway stores, which is what this store was until Regent Park Shopping Centre opened, and Safeway moved into that complex. Regent Avenue from Day Street to Bond Street has always been “downtown” to Transcona residents. Many stores are family owned businesses with fascinating stories, while others seem fated to frequent change. Of course, there are many more buildings and stories of Transcona than could be included in this short tour. More comprehensive tours are being planned in conjunction with the updated history of the community which was prepared for the celebration of the 75th anniversary in 1986.